The Newman Center near the University of Maine campus in Orono. Catholic churches in the Orono-Old Town area have launched a $3.5 million capital campaign to remodel one building and repair three others, the Roman Catholic Diocese of Portland announced Monday. With the largest undertaking planned for the Newman Center at the University of Maine, the diocese said it hopes it can persuade more Catholic UMaine students to continue worshipping while in college and address the building’s energy inefficient design. 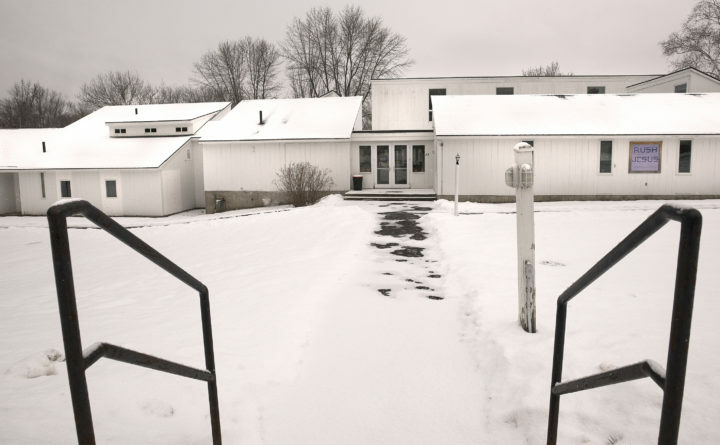 The renovations and an addition at Our Lady of Wisdom Newman Center, located at 83 College Ave. in Orono, would account for $2.2 million of the $3.5 million to be raised, said the Rev. William Labbe, pastor of the Parish of the Resurrection of the Lord, which includes Catholic churches in Orono, Old Town, Bradley and Indian Island. The Newman Center was built in 1972 as a modern worship and study space for Catholic students and faculty at the University of Maine to replace the log cabin used for masses beginning in 1946. It has been the only Catholic church in Orono since St. Mary’s on Main Street closed 10 years ago. That church was sold in 2010 and is now the Stone Manor, an event center. The renovation plan calls for the center’s worship space, which is open, to be enclosed to separate it from other activities, the press release said. A new multipurpose space for meetings, ministries and fellowship will be built. The kitchen also will be remodeled. The installation of weather-resistant siding, separate entrances to the worship area and the rest of the center, and a new roof line will make the building more user-friendly and efficient, according to Labbe. Stained-glass windows donated from the former St. Ignatius Church in Sanford also will be installed. The diocese said it also hopes a remodeled building can play a part in ensuring that Catholic students continue to worship while they attend UMaine. Repairs at the three other churches in the parish will be less extensive. Holy Family, located on 429 Main St. in Old Town, will undergo a variety of structural repairs, including some interior painting. The repaving of parking lots and driveways also is under consideration. In Bradley, the parking lot of St. Ann’s, located at 84 Main St., will be regraded and repaved, and single-walled oil tanks will be replaced with safer doubled-walled tanks. Minor roofing repairs are also part of the job. At St. Ann’s on Indian Island, the exterior will be painted, the chimney will be rebuilt and the tin ceiling will be repaired. The church parking lot also will be repaved. More information about the campaign is available on the parish’s website, www.resurrectionofthelord.org/weshare.